Times football journalist Oliver Kay has won the 2017 Cross Sports Book of the Year award for his debut book Forever Young: The Story of Adrian Doherty, Football’s Lost Genius. Kay, the newspaper’s Chief Football Correspondent, was named as the overall winner after sports book fans were asked to vote for their favourite among the nine category winners selected by the judges and announced at a ceremony at Lord’s Cricket Ground last month. Forever Young, which charts the tragically short life of former Manchester United player Doherty, was written with the co-operation of Doherty’s family in Belfast and Kay thanked them in a tweet on learning the news, declaring himself to be “amazed and delighted”. Doherty, a maverick character among United’s golden generation of Ryan Giggs, David Beckham, Paul Scholes and the Neville brothers, was rated by his peers as the best of them all, a player with natural ball skills and lightning pace. Sadly, his career was cut short before it had really begun by a knee injury but the path he followed after football was not typical and assumptions made about the circumstances of his death proved to be wide of the mark. Forever Young, which was Football Book of the Year with the judges, polled highest with the public among a strong field that included controversial footballer Joey Barton, whose No Nonsense won the Autobiography of the Year category. 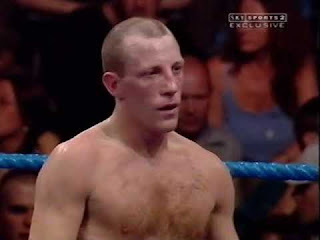 No Nonsense was written in collaboration with Michael Calvin, the distinguished sports writer who was ghostwriter when rugby player Gareth Thomas won the overall prize in 2015 with Proud, and who won in his own right the year before with The Nowhere Men, his widely acclaimed insight into the life of football’s largely anonymous army of talent scouts. 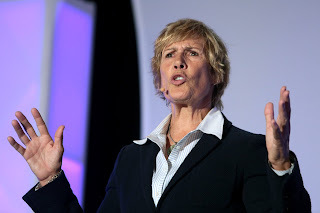 The other category winners included Find a Way by Diana Nyad, which was judged International Autobiography of the Year, telling the story of how she became the first person to swim the shark-infested waters between Cuba and Florida with no cage for protection. 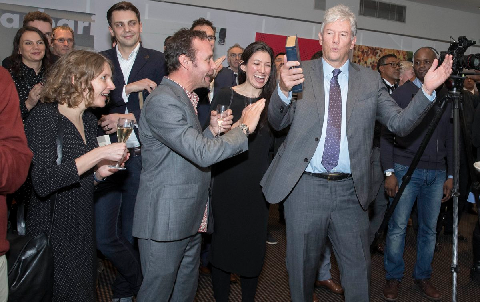 British and Irish Lions second row forward Paul O'Connell’s The Battle won the Rugby Book of the Year award, whilst Tour de France cycling legend Chris Boardman secured the Cycling Book of the year with Triumphs and Turbulence: My Autobiography. Broadcaster and former cricketer Mark Nicholas won The Cricket Book of the Year for his memoir called A Beautiful Game. 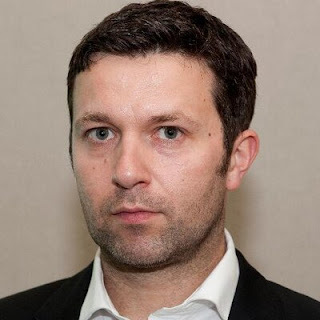 And The Sun Shines Now, by Adrian Tempany, which deconstructs the dramatic changes that have taken place in English football in the 25 years since the Hillsborough disaster, was awarded New Writer of the Year. The Lane by Adam Powley, Martin Cloake and former Tottenham Hotspur captain Steve Perryman, was named Illustrated Book of the Year. Biography of the Year was Robert Wainwright’s story of The Maverick Mountaineer, the eccentric climber George Finch. A special award for Outstanding Contribution to Sports Writing was presented on the awards night to arguably the most outstanding writer of our generation, Hugh McIlvanney. Best International Autobiography Award - Find A Way by Diana Nyad (Penguin Randomhouse). Barbarian Days: A Surfing Life. 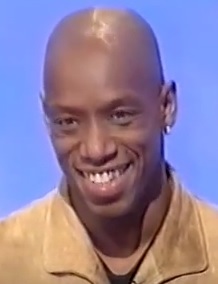 Mark Lawson, John Inverdale and Clarke Carlisle. 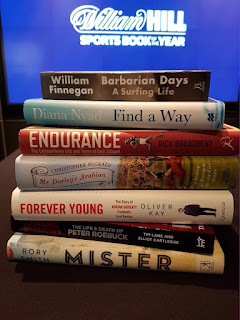 Surfing memoir Barbarian Days, described as “compelling, elegiac and profound” by the chair of the judging panel, has won the 2016 William Hill Sports Book of the Year Award for American author William Finnegan. The book, which has already won a Pulitzer Prize for the veteran New Yorker magazine writer, tells the story of Finnegan life through the prism of his 50-year obsession with surfing, from his childhood days in California and Hawaii to the present day. Barbarian Days beat a particularly strong field to land the £28,000 cash prize that goes with the award, which also comes with a leather-bound commemorative copy of the book, a £2,500 free bet with the sponsors and a day at the races. 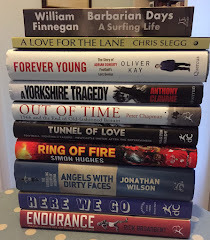 Finnegan's work was chosen from a shortlist that judges' chair and co-founder of the award Graham Sharpe dubbed "a ‘Magnificent Seven’ of sporting books". 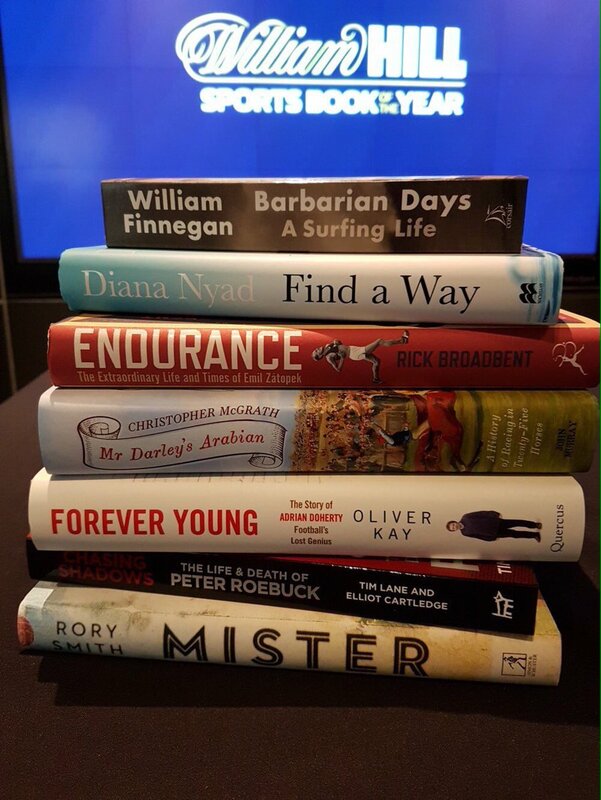 The list comprised Diana Nyad's long-distance swimming memoir Find a Way, Rick Broadbent’s Endurance, a biography of Czech Olympic runner Emil Zátopek, Tim Lane and Elliot Cartledge’s Chasing Shadows, an investigation into the life and death of cricketer and journalist Peter Roebuck, Oliver Kay’s Forever Young, a biography of "football’s lost genius" Adrian Doherty, Rory Smith’s Mister, a study of how English coaches managers taught the world how to play football, and Christopher McGrath’s Mr Darley's Arabian, a history of horse racing through the lives of 25 horses united by one bloodline. But it was Barbarian Days that impressed the judges the most. In some ways a controversial inclusion on the shortlist, in that there is no element of competition either with other surfers or the record books, it won them over for the sheer brilliance of Finnegan's prose and the sharpness of his insights as he pursues a compelling quest to find the finest surf on the planet. Broadcaster John Inverdale, who presented Finnegan with the award at a ceremony at BAFTA in central London, said that the decision of the judges had been unanimous. “People thought this was a genuinely extraordinary book, about life – about a certain kind of life. It’s a bit hedonistic. It’s a bit reckless. A lot of people will identify with it. A lot of people will envy it. 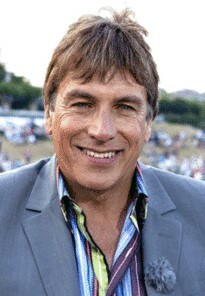 Another judge, the journalist and broadcaster Mark Lawson, endorsed Inverdale's words, although he admitted that some on the panel had needed to be convinced that surfing should be considered as a sport. "Although the author himself acknowledges the scepticism of some about whether surfing is a sport, the judges felt that Finnegan's account of the physical and psychological drive to achieve athletic perfection make Barbarian Days a worthy winner of the award. "The autobiographical detail and precision of the writing also make it rewarding to those who might think they would struggle to get on board with surfing as a subject." Finnegan, who now lives in Manhattan yet still surfs regularly off Long Island, has been a staff writer at the New Yorker magazine for nearly 30 years, often travelling to conflict zones and his previous books reflect that. Two have been rooted in his experiences in South Africa in the days of apartheid, another is about conflict in Mozambique and his most recent, Cold New World, shines a light into the bleak lives of disadvantaged American teenagers growing up hopeless and desperate in their own country. Veteran William Hill spokesman Graham Sharpe, who co-founded the award with the late John Gaustad, said of the winning entry: “Compelling, elegiac and profound throughout, Barbarian Days offers a revelatory and often dramatic study of the elegant art of surfing. As we follow William Finnegan’s story we see not just the maturing of a boy into a man, but of a rebellious soul coming to terms with society on his own terms. "We also see, as we so often do, how sport reflects politics, economics and an ever-shrinking world, as surfers fight to protect their hidden beaches and continue their search for new waves to master. 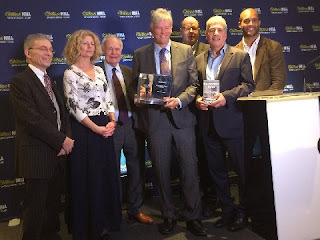 In addition to Sharpe, Lawson and Inverdale, the judging panel for this year’s award consisted of former chairman of the Professional Footballer’s Association chair Clarke Carlisle, broadcaster Danny Kelly, doyen of sportswriters Hugh McIlvanney, and Times writer and author Alyson Rudd. This is the book that Hillary Clinton apparently said would remain by her side throughout her campaign to be President, as a source of inspiration. Diana Nyad excelled at open water swimming. In 1975 she swam the entire 28 mile (45km) circumference of the island of Manhattan in a world record time and in 1978, on her 30th birthday, swam the 102 miles (164km) from the Bahamas to Florida. This despite suffering abuse at the hands of both her stepfather and a swimming coach as an adolescent, and spending three months in hospital with a heart infection. When she retired from competitive swimming, she pursued a successful career that combined journalism, broadcasting and motivational speaking among other things. But all the time she was persistently nagged by the memory of something she had wanted to achieve but failed, which was to swim from Cuba to Florida Keys. 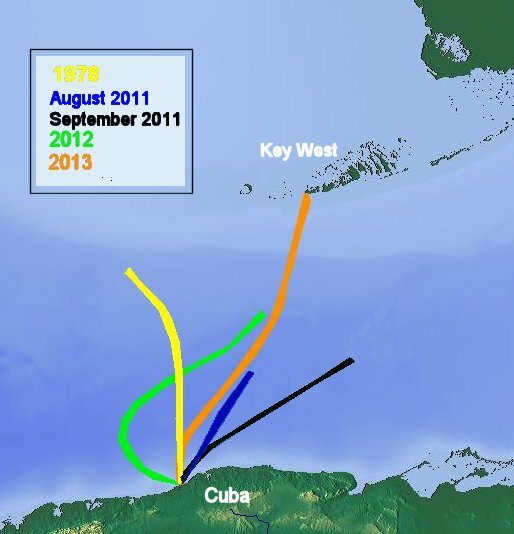 Among extreme distance swimmers, Cuba to Florida is like Mount Everest is to climbers, the ultimate challenge, a stretch of water possibly as intimidating as any on the planet, the point at which the Gulf of Mexico gives way to the Atlantic Ocean, prone to violent storms and unpredictable currents and home to shoals of deadly jellyfish and countless predatory sharks. She had made an attempt in 1978, swimming inside a 20' by 40' shark cage, but had been forced to give up after 42 hours, having swum 76 miles (122km) but having been blown badly off course by winds so strong she was repeatedly slammed against the cage. Nyad's friends will testify that they never expected one attempt would be enough, such is her strength of character and unwillingness to accept defeat. Yet they would not have anticipated just how she would get back in the water and pull it off. 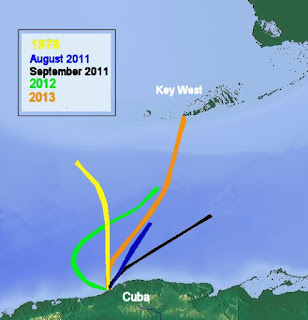 She did so on September 2, 2013, when she emerged on to the sands of Key West after swimming 111 miles from Havana in an epic feat of endurance and indefatigable will, completing the passage in 53 hours. It was her fifth attempt, the final four taking place from 2011 onwards. She was 64 years old. Along the way, escorted by her support team, equipped with a protective suit to protect her from the horrific, paralysis-inducing jellyfish stings that had been her downfall in previous attempts - but with no shark cage - she sang to herself and regularly revisited the messages of her mantra, the one that had driven her not only in the water but in life. She made it part of the triumphant address she gave to the crowd that greeted her as she stepped out of the ocean at Key West. "One," she said. "Never, ever give up. Two: You're never too old to chase your dreams. Three: It looks a solitary sport, but it's a team." Some critics have felt the book reveals a somewhat needy side to Nyad's personality, seeing in it a constant craving for self-justification. Others, though, will find it an inspiration. 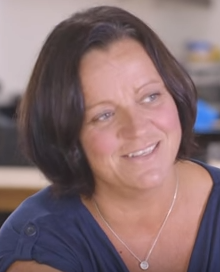 There is much about her life and the experiences that helped develop her personality. Whether it is a personality that appeals is a matter for the individual but it is hard to imagine many readers will not be gripped by her descriptive powers as they are taken, almost stroke-by-stroke, through the perils of swimming in a hostile ocean, or will not appreciate the inner resources that sustained her through the long days and nights of training, enabling her to face down her fears and ultimately overcome the force of nature. The winner of the 2016 William Hill Sports Book of the Year award, worth £28,000 to the successful author, will be revealed at an afternoon reception at BAFTA, in central London, on Thursday. There will a poignancy about this year's award ceremony in that it will be the first since John Gaustad, the award's co-founder and proprietor of the much-missed Sportspages book shop in central London, passed away earlier this year. Big-name interviews sell newspapers, we are always told. But how often does a star player tell you anything you did not already know? Football is a micro-managed business these days, with minders and media advisers never far away. 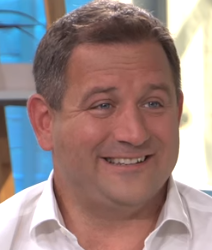 It is why Times journalist Rory Smith admits the stories he most enjoys writing are often the less obvious ones, with interview subjects who may seem obscure on the face of it but frequently come with a fascinating back story waiting to be told. So when a friend drew his attention to a story in Southport's local paper about a belated honour for a war hero his curiosity was instantly piqued. The war hero was Alan Rogers, who had as a teenager served as a gunner on a Royal Navy destroyer assigned to protect the Arctic convoys from marauding German warplanes and predatory u-boats as they shipped supplies to the Soviet Union. 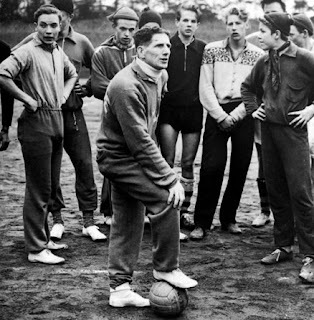 In a footnote to his description of the perils he faced in that role it was mentioned that after he had done with serving his country he had been a football coach, not in Britain but in a long list of other countries around the world. Smith immediately wanted to know more. He arranged to meet Alan Rogers, by then almost 90, in his modest Southport flat and learned that he had never played professional football and could not get a job as a coach at home yet met with such appreciation abroad for his ability to teach the game that he found work from Iceland to the Philippines. In the Iranian capital, Tehran, whose Persepolis team he coached to four championship titles, he is remembered with particular affection. Talking to Rogers gave Smith the idea for this book, which takes its title from the quintessentially English term of address that was adopted across the world to describe a coach. From the most famous 'Misters', such as Charles Miller, Jimmy Hogan and George Raynor - who won the 1948 Olympics with Sweden and a decade later took the same country to the World Cup final - to those like Rogers, whom celebrity largely passed by, Smith tells the story of how the football teams who dominate the game today, at club and international level, owe so much to the Britons who spread the gospel of the game around the planet. The book does much to explain how these pioneers and missionaries not only taught the rest of the world how to play football but helped them become better players than our own. Often, the Misters were not merely good teachers but innovators, too, with a chance to put forward ideas that were all too often rejected at home, where training tended to be about fitness and muscularity rather than ball skills, and change was considered unnecessary. Nowadays we tend to look at the Brazilians and Argentinians, the Spaniards and the Dutch as if they possess inherent gifts to which our players simply cannot aspire. Yet go back in history and it was Jack Greenwell, an amateur player from Crooks in County Durham, who laid the foundations for Barcelona's attacking philosophy. 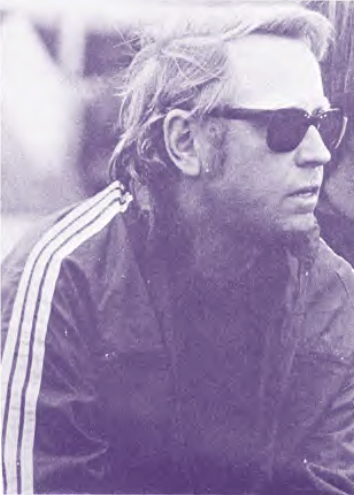 And the Total Football with which the Netherlands came so close to conquering the world in the 1970s can be traced back to Vic Buckingham's time in charge of Ajax. It is something of an irony that in today's Premier League only four teams have English coaches and only seven British. Will this fast-paced history of horse racing's greatest bloodline turn out to be the 'bookie prize' favourite? Mr Darley's Arabian: High Life, Low Life, Sporting Life: A History of Racing in 25 Horses. In the early part of the 18th century, when the landscape and politics of the Middle East was rather different from today, a gentleman merchant by the name of Thomas Darley, working for the Levant Company in Aleppo, acquired a horse. It was a bay colt, taller than the average Arabian horse. In a letter to his brother in 1703, Darley noted that it was strikingly handsome and "with an exceedingly elegant carriage". 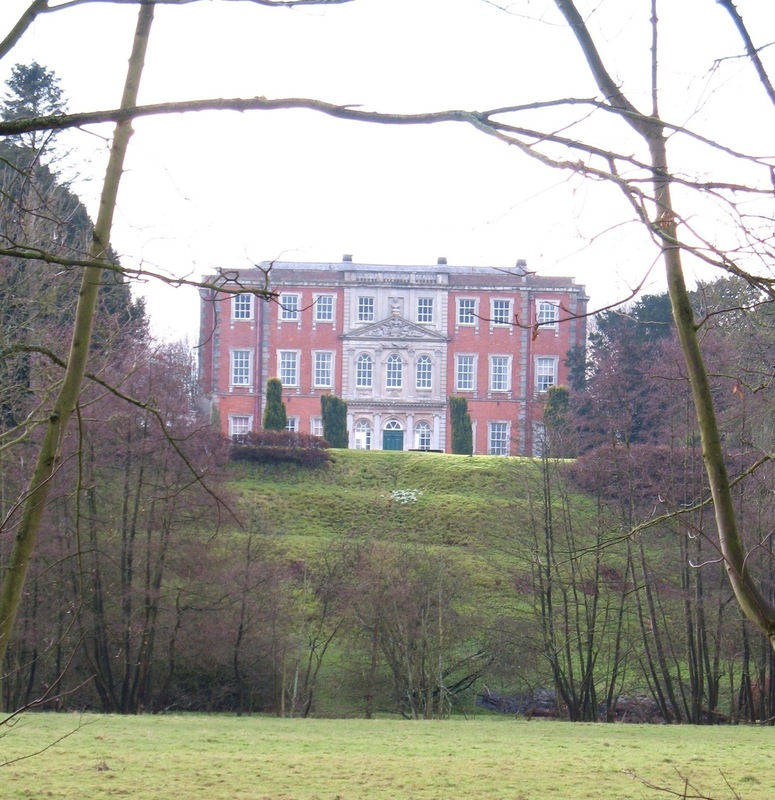 He bought it for his father, Richard, with plans to take it back to the family's country seat, Aldby Park, not far from the village of Stamford Bridge in the East Riding of Yorkshire. In some accounts, it has been suggested that Darley came across the animal after reviving his interest in hunting and thereby coming into contact with Bedouin tribesmen but little is known about the precise circumstances in which he acquired it. Hailed for its speed across the ground, it had been given the Arabic name "Ras el Fedowi" - "The Headstrong One". What is known is that the deal would become arguably the most significant piece of horse trading that ever took place. The colt was duly shipped to Yorkshire, spending the larger part of an arduous journey suspended in a kind of hammock in the hold of a merchant ship. It was never raced but spent 14 years covering mares at Aldby Park, its genes introducing speed to the traditional strength of the English breeds, and in doing so created the most powerful bloodline in the history of thoroughbred horse racing. All thoroughbreds, in fact, are descended from just three stallions, all imported to England at around the same time. Ras el Fedowi, who became known as the Darley Arabian, was one. The others were the Godolphin Arabian and the Byerley Turk but the Darley line was so powerful that over time the influence of the other two has dwindled. 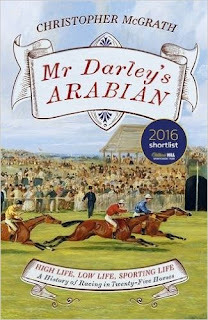 Today, according to author Chris McGrath, the lineage of an incredible 95 per cent of the participants in any thoroughbred race, anywhere in the world, "from Royal Ascot to the Melbourne Cup to the Kentucky Derby" will be descended from Mr Darley's Arabian. It was from this starting point that McGrath, a fine writer who was for a number of years the horse racing correspondent of the Independent newspaper, decided to write a history of the sport with the lineage of the Darley Arabian as its central thread. A simple idea, it is one that works admirably. 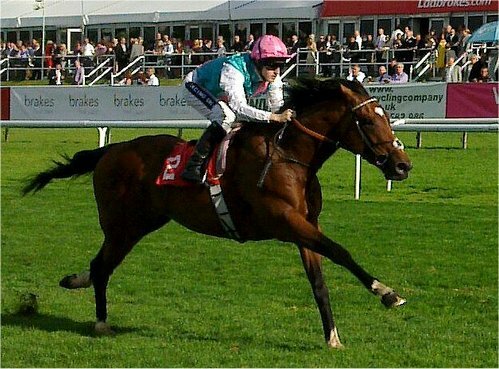 Beginning with Thomas Darley and Ras el Fedowi and ending with the brilliant Henry Cecil-trained Frankel, winner of the 2011 Two Thousand Guineas and a record nine consecutive Group 1 races, it tracks more than 300 years of horse racing, essentially through the careers of 25 horses but touching upon pretty much every champion in that time. There is an enormous cast of human characters, too, from rogues to Royals (which some falling into both categories), from which McGrath draws some wonderfully engaging tales, all told at a frenetic pace that compels the reader to turn page after page with scarcely time to draw breath. Thoroughly researched and clearly an enormous project, Mr Darley's Arabian perhaps suffers a little for containing perhaps such an enormity of detail and so many stories, taxing the brain's ability to take it all in, although far better to provide too much information than too little. In any case, there is no law against reading a book twice, or many more times. And one of the joys of a book with such a broad scope is that a second exploration of its pages often finds previously overlooked gems nuggets that make it an even more fulfilling experience. 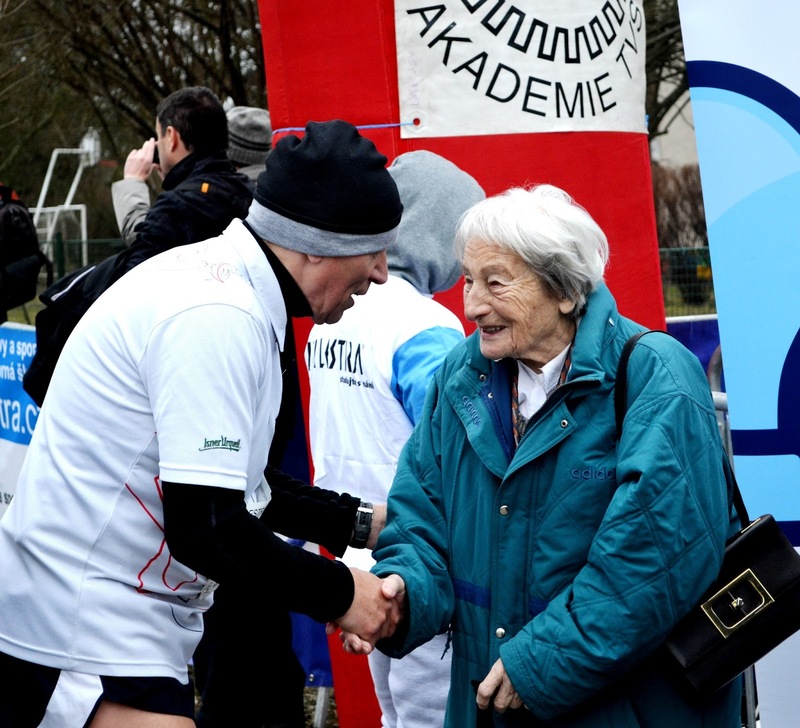 Will it be third time lucky for Times man Rick Broadbent with his wonderful story of the magnificent runner Emil Zátopek? Rick Broadbent comes to the table with a bit of form, having been shortlisted twice before without convincing the judges he was worthy of the prize. 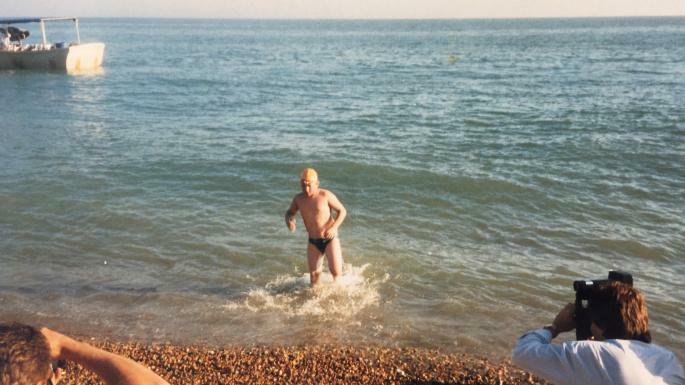 Having been unlucky with Ring of Fire in 2009 and That Near Death Thing in 2012, he switches from sport on two wheels to two legs, swapping motorcycle racing for distance running. 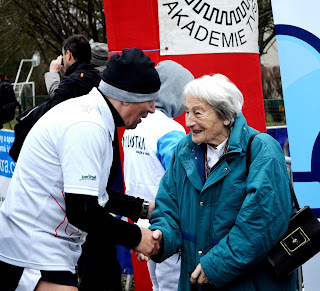 Emil Zátopek's world records have all been overtaken now but his status as the world's greatest long-distance runner, possibly the greatest athlete across all distances, remains intact. Long before the cheats came along to rob athletics of its innocence and purity, Zátopek was causing crowds to look on with wide-eyed incredulity at what he was able to do. At the peak of his powers, between 1949 and 1955, he set 18 world records at distances from 5,000 metres to 30,000m. At the Helsinki Olympics in 1952 he won gold at 5,000m, 10,000m and the marathon, a treble unlikely ever to be matched. His times in all three events were Olympic records. 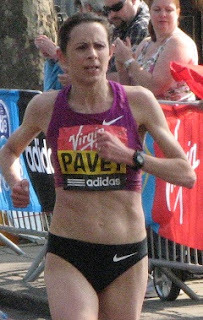 He was the first to run 10,000m in less than 29 minutes, achieving that particular feat in Brussels just 48 hours after becoming only the second to complete 5,000m in less than 14 minutes in Paris. He was also the first to run 20,000m in under one hour. All this despite a running style that was visually bizarre and made him an instantly recognisable figure on the track even from the very back of the deepest grandstands. His head rocked, his arms flailed, his tongue hung out of his mouth; yet in contrast with his ungainly top half, below the waist his legs were like rhythmic pistons, working as hard and as fast as he commanded them. 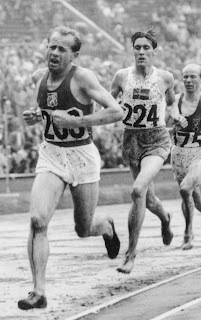 The Emil Zátopek story would be a compelling one for his achievements alone yet there is another thread to it, one that has not been explored fully until now, surrounding the politics of revolution and suppression of Czechoslovakia in the late 1960s, the liberalisation movement known as the Prague Spring that was eventually halted only by a Soviet invasion. Zátopek was a member of the Communist party and a soldier in the Czech military and as such was sometimes accused of being a puppet of the Czech government yet after protesting against the arrival in the capital of Soviet tanks he was arrested, stripped of his ranks and sent into exile, obliged to take a succession of physically demanding and dangerous jobs in the most remote and sparsely populated areas of the country. He disappeared essentially for two decades, dismaying those for whom he had become a political hero by renouncing the beliefs he had stood for in 1968, although it seems likely he was coerced into doing so under the threat of imprisonment. Only when communism collapsed in 1989 was he allowed to return home and begin again a normal life. Times journalist Broadbent attempts to find the missing elements of the story in a compelling, superbly written narrative, drawing on extensive interviews with many whose lives he touched, including his widow, Dana, an Olympic champion javelin thrower he married in 1957 yet from whom he spent so many years apart. There is considerable eye-witness evidence, too, that Broadbent has pulled together from the documented accounts of contemporaries long departed, which he uses with great skill to paint a picture of Zátopek as a man as well as an athlete. Endurance survived the cut where another book about the same subject, Richard Askwith's Today We Die a Little, did not progress from longlist to shortlist. Some say it must have been a close-run thing but having made the final selection there is no arguing that Rick Broadbent does not deserve his chance to be third time lucky.